The NHS is talking a good talk about patient involvement, and it’s great that the idea is gaining such acceptance. But the mechanics of implementing it are still falling well short of a good walk. I’ve been exasperated by two lots of communication recently related to patient involvement. Probably out of all proportion, you’ll think, but I’m SO tired of NHS England talking up patient involvement and then just doing it in a very half-arsed way. The first was a couple of months ago when I was invited to speak at a conference which was, splendidly, dedicated to ‘empowering patients to manage their long-term conditions’. It promised to ‘go beyond the usual rhetoric’ and to take a ‘holistic, person-centred approach…’, and even constituted a People’s Panel to ensure discussions were centred on service users, and to hold the conference to account. So, anyway, you’d assume that it would have its patient involvement sorted. So I was a bit surprised to get an email one day from the organisers asking me to let them know my travel requirements by close of play so they could book them. I was out, and busy with – yer know – life, so emailed back to say I’d sort myself out and would presumably be able to claim afterwards. No, they wanted to make the arrangements, and could I send them details. Well, no I just couldn’t. I pointed out that I’d need to organise my own transport – I live deep in rural Beds, and travel isn’t straightforward at the best of times, but I also need to sort assistance for myself on the train with the splendid people at First Capital Connect (good) and their S-L-O-W and cranky system (bad). When they conceded on this, they then insisted I do it that day, right then, so that I could tell them what it would cost. Well, no I still couldn’t, for the same reasons I couldn’t fulfil the original demand. Did they think I was making it up the first time? whether I ‘was sure that the train station I’d specified was the nearest to where I live?’ Sighhhh. Really? This was all a bit ironic, considering that the conference – and pardon me if I shout here – WAS ABOUT PATIENT CENTREDNESS!! I was so incensed by these emails, this querying of my wits and my integrity, that I came within a hair’s breadth of pulling out altogether. Now, I may have a short fuse, but this stuff matters. Patient involvement, patient centredness, call it what you will, includes listening to, respecting, hearing, integrating patients. Then this? An assumption by the organisers that I’m dim, that I wasn’t used to organising myself, didn’t know where my local trains station was. Also – and you get this quite often – that I had an empty, barren life in which I could drop whatever I was doing and respond to emails instantly with detailed requirements. And all this hassle, so that I can give my time voluntarily, freely, to support their stupid conference? It beggars belief. Actually the conference was great. It invited me to apply to be a Patient Champion, and to sit on a panel validating the assessment of young NHS professionals on a training programme. The email was very annoying for a number of reasons, not least by patronisingly assuming that I’d get excited about potentially being designated a ‘Champion’. What? Do they think I’m six? It didn’t have a signature at the end, so came only from a mysterious ‘administrator’. So that was friendly. It was sent mid afternoon on Monday, with a closing date for applications on Sunday. Because, of course, patients-users-carers aren’t doing anything with their crap lives except watching Homes Under the Hammer, and can leap to this stuff. But six days seems like short notice to me, and I’m really not sure if I can fit it in. And you can’t help wondering if the HCPs involved only had six days’ notice. We were asked to follow the application instructions in the attachments, and to ‘send in the application form below.’. But in fact there wasn’t an application form, so how does one apply, actually? I was at a meeting of my regionally based Cancer Partnership Group today, and several people I spoke to had had the email, opened it and ditched because it was a mess. The thing is that patient involvement, and patient-centred self care etc, isn’t just a good idea, it’s an absolute necessity for lots of reasons; it’s going to be the only thing that stops health provision from imploding all over the western world. It has to be done, and there are brilliant people in the NHS working hard to try and make it work. Hats off to the folks at the Patient and Public Voice Team, and to those at the Coalition for Collaborative Care, and in the East of England for busting guts to make this stuff real. But lots of people are paying lip service. It isn’t good enough to bleat on about the importance of the patient voice, constantly to harp about the crucial input and contribution from patients, without putting in place the appropriate mechanisms and systems (including expense and travel systems) that actually allow patients and carers to participate and engage. It isn’t enough to remember at the last minute to ‘get a couple of patients along’ and wheel them out as proof that you’re listening. If your systems don’t work, if you don’t give credence to what you’re being told, if you don’t give time and notice in which to act and prepare, you aren’t. Believe me, I know where my nearest station is. For those with time on their hands, try plotting the journey from Custom House to Southfields using TfL’s splendid step-free tube map. The map is splendid, the tube ain’t. Policies promoting 28-day prescribing by GPs ‘are likely to be a false economy as they cost at least as much as they are projected to save’. So said Pulse magazine (in October 2012). What they didn’t say is that from a patient’s point of view – particularly if you have long-term conditions (LTCs) – the policy also drives you to distraction. I need to take omeprazole and a low dose of aspirin every day. The diabetes that you get thrown in free with a Whipple’s means I also need insulin, and the gear that goes with blood-glucose testing several times a day. And the lack of pancreas (that rather zippily puts the pancreatico in ‘pancreaticoduodenectomy’) requires that, whenever I eat, I replace my absent digestive enzymes with Creon (used widely by people with cystic fibrosis). I mostly only see the doctor, every three months, to get my prescription reviewed and signed off again. I can only get 28 days supply. This is rubbish on a number of counts. First, I’m not going to use any more drugs or paraphernalia, just for fun, just because it’s there. The arguments about wastage – that people throw away or stop taking their antibiotics because their cough has gone – don’t apply here. I’m not going to stop taking Creon with everything I eat (really). I’m not going to leave the insulin in the cabinet because I think the diabetes has cleared up. And you don’t finger-prick for fun. If you do, go to a more appropriate website. So giving me three month’s supply won’t lead to wastage, and that’s clear if you just look at what I’m taking. Second, the article above makes it perfectly clear that surgery staff – GPs, receptionists, dispensers and clerical staff, as well as pharmacists – are spending an inordinate amount of time, doing an inordinate amount of paperwork reviewing and signing off regular prescriptions. I appreciate that it is important to review meds, for many reasons. But in my case, and I’m sure in that of many others, the requirement for this stuff is absolutely not going to go away. Not until, ahem, you know… This is stuff that we’re stuck with. So reviewing it monthly is pointless as well as expensive. The third thing that bothers me is the sheer tedium of the process. It’s bad enough, as you may know yourself, taking drugs everyday. It’s even more tedious managing diabetes, every single time you eat or drink, and often in between. (Yes, yes, it’s the price of the life-preserving cancer surgery. I’m fine with that, and grateful, and happy to be alive. Sorry. I just dropped my zen there for a minute.) So it’d be a boon to me, it’d actually be a small glory, not to have to worry about my prescription quite so regularly. Not to have to calculate how soon to re-order. Are we running into a Bank Holiday? Can I get down there on Friday? Better explain that I’m going away, so ordering early. Having an LTC is inconvenient, but mainly it’s tedious. It is absolutely not fascinating, so try not to say that next time you’re tempted to pore over my gear. It’d be just a bit less tedious to be able to go three months instead of 28 days. It’d be, yer know, nice. Anyway, my fourth point is that, because of the above, I have to go to the surgery, every 28 days, to pick up my prescription and, in all likelihood, sit there and wait while it’s dispensed. It’s lovely, and the staff are nice. But just going, just parking there, just being there, with the institutional chairs, with the coughers and the dribbly, fevered children, every 28 days, make you feel… well… like a patient. I know. I know, I am. But most of the time I’m not ill, I’m just managing my LTCs, with all the other bloody ‘expert patients’, and getting on with my life, which I happen to like and enjoy. And it always just makes me a bit miserable and to be honest a bit resentful, to be reeled in again to the bleeding surgery. If I had a 3-month prescription I’d honestly feel better, freer, less tethered to the service. Yes, less tethered. Don’t assume wastage. Look at what I’m actually taking and question whether it’s likely that I’ll leave it in the cabinet. Don’t review stuff on a 28-day basis that I’m definitely going to need for ever. Give me a break from the relentlessness. I’ve got so many better things to do. Release me from this pointless umbilical cord and trust me. Come on, guys. You were the bright ones in your class. Use some discretion. Patient-centredness is close to my heart. If it’s close to yours, you might want to take a look at the Coalition for Collaborative Care, which is working to put patients front and centre of their own care. Oh dear, I really hadn’t expected to do research at the pointy end of 7DS, but an unscheduled trip to Addenbrooke’s in Cambridge on Saturday night provided that very valuable, ‘lived experience’ that you’d be happy for someone else to bring to the meeting. Ambulanced in with severe upper abdominal pain, and with a long history of surgery for renal cancer (including a Whipple’s in early 2011), the prospects of discovering a) secondaries, b) bleeding and c) an adhesion-related obstruction, were daunting to say the least. A blue-light entrance on a Saturday evening, just a week into a massive and ambitious conversion to a total-hospital e-system, didn’t exactly fill us with dread. But you wouldn’t have hand-picked the timing. 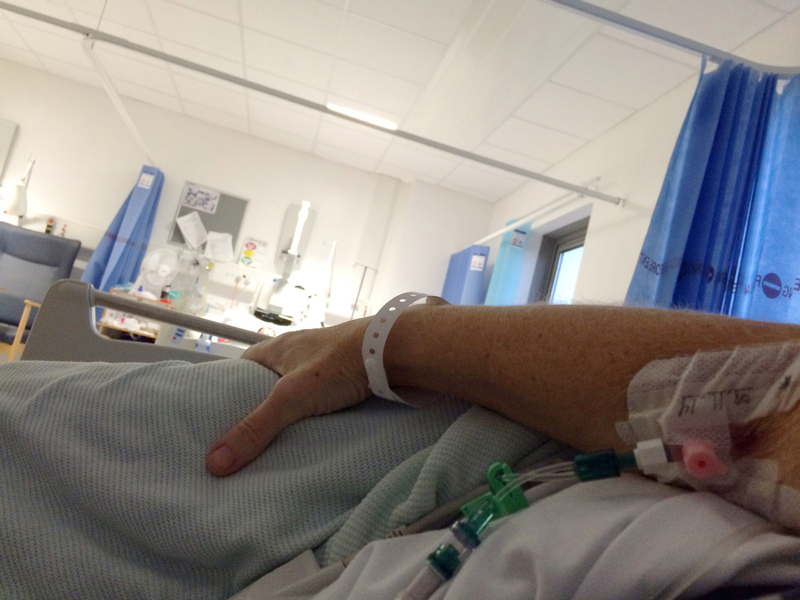 So, with 48-hours as an in-patient, how did Addenbrooke’s stack up on these burning issues? Let’s look at EPIC, seven-day services, and patient-centredness. First, EPIC. Addenbrooke’s had switched, overnight, to a paperless electronic system almost exactly a week before. We were met at A&E by a nurse standing behind a tall, wheeled computer (I’ve just learnt that these are COWs, computers on wheels). She greeted my ambulance team calmly, and the other four that arrived within a minute. We were all logged in within five minutes, and most patients were dispatched to bays. Waiting for a while on a trolley, I watched as orange-armbanded floorwalkers and ‘super-users’ helped on the spot with small queries from staff as they logged histories and other info. Other glitches were logged (and apparently are addressed very quickly). All data from obs was bluetoothed via the handheld ‘Rover’ units into the system automatically. There honestly wasn’t a piece of paper in sight. Once I was on the ‘majors’ assessment ward, throughout the night staff accessed blood results, histories and CT reports directly from the datapoint in my cubicle. And for the rest of my stay, I was impressed! Staff were still familiarising themselves with the system and, when asked about it, some staff rolled their eyes and cited ‘early days’, while others were emphatically positive that the system is already making a difference. Meds, test results, prescriptions, doctors’ notes – everything was to hand in a single place. Staff across the hospital can access records remotely. An insulin-pump educator who came up from the diabetes clinic on Monday had been keeping an eye on my blood glucose levels all day! Verdict: a gob-smackingly ambitious project, well executed, and brilliantly project-managed. Steady and holding. You wouldn’t volunteer do go into A&E on a Saturday night. But Addenbrooke’s 7DS performance was pretty impressive. I was triaged, assessed by two different medics, and moved to ‘Area B’ in short order. The place was busy, but the atmosphere was calm and organised. At midnight I was sent down for a CT scan (more of this below), so no issue with diagnostics. At 3am I had a long-ish conversation with a doctor, and we concluded, amongst other things that I’d be admitted, and that they ‘get me somewhere more comfortable’ asap. I was moved to a ward at about 4.40am, and dealt with there by nursing staff who couldn’t have done more to allay my anxiety, or to make me more comfortable. Through the little that was left of Saturday night/Sunday morning they were very attentive with obs, particularly with blood-glucose monitoring. Of course, we expect A&E to be fully girded and running. But still the level of staffing, the availability of tests, and the attentiveness of staff was impressive. Sunday saw more diagnostics/tests, with an x-ray at tea-time (no tea for me, mind!). This time the results were s-l-o-w getting back, and it wasn’t until 9.30pm that word came that ‘the gastrografin had gone through’ and I could eat something. The ‘missing meals’ service produced a lasagne at about 10.15pm, which I sort of fell into. Hadn’t eaten since Saturday brekky. It went down a treat, and I thought that wasn’t bad for late on Sunday night. Sunday was also impressive for the attention that nursing staff paid to my iatrogenic (T1-ish) diabetes. Hospitals generally don’t have a great history of dealing with diabetes in in-patients, particularly where the patient has been admitted for non-diabetes related reasons. I was sceptical about the staff’s ability to manage my diabetes, and actually handled my own insulin administration throughout my stay. But we did the BG testing between us, and at night they were brilliant, actually, and came every hour or two to check it. Verdict: diagnostics, care, timeliness and staffing were pretty damned good. On the way to my CT scan, just after midnight, I remembered that in just two weeks I was due for my regular, 6-monthly thorax-abdo-pelvis scan before seeing the Oncologist, and it occurred to me that it wouldn’t be sensible to have half my trunk scanned now, only to do it all again in two weeks (I’m running at 40+ CT scans, I think). So, slightly dubiously, I asked the reasonably-hard-pressed radiographer whether it would be possible to do that whole scan now, rather than do just part and have to repeat it in a couple of weeks. It threw him for all of five seconds, then he went off for a few minutes and returned with a ‘Yes, we can do that.’ It would have been a lot easier to point to the request, nod at the queue, claim he was following orders, and fob me off. But he appreciated my concern, and took the time to make this possible. Points. At about 3am on Sunday morning, still in A&E, in discussion with the doctor after my CT result had come through, he talked about suspending my insulin pump and putting me on a ‘sliding-scale’ glucose drip to manage my BG levels while I was being ‘starved’ (to address what he’d conclude was an adhesion-related obstruction). I demurred: I’m very insulin-sensitive, and was worried about the check-and-correct approach that would be involved. As an ‘expert patient’, I know that I can manage my diabetes better than anyone else can so, unless I was going to descend into a state where that wasn’t possible, I wanted to hang on to my pump and controller. We talked for maybe 20 minutes about the options, and exactly how we’d manage them, and in the end agreed between us to go with me being pump-boss. I was hugely impressed by this attitude, and by the subsequent support I got from ward staff. I knew that the recently-formed Diabetes Clinic’s Outreach Team would become aware of my being on the ward, and would probably get in touch (as well as monitor my BG remotely!) at some stage. I also knew that an on-call Diabetes consultant was about. It is a shame then that, with my BG dipping a bit through Sunday, my suggestion that we have a word with the consultant (a pump specialist, as it happens) was met with some reluctance by the nursing staff. In fact, the nurse went off ostensibly to speak to him, and looked embarassed later on when I asked about it, and said that she’d decided not to. She’s entitled to change her mind, of course, but I’m entitled, I think, to know that she has. I still think it was a wrong decision. This situation was exactly the sort of scenario for which he was present in the hospital. Verdict: mostly, really very good. Impressive, actually. With just a little bit of work to do in parts.